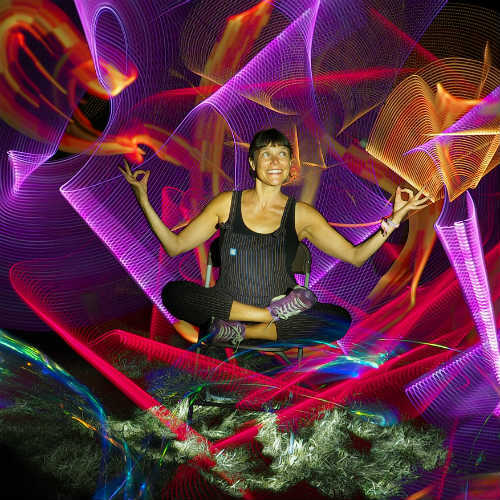 Wide-eyed amazement and slack-jawed disbelief is the most common response to participating in the creation of one of The Light Painter’s images. 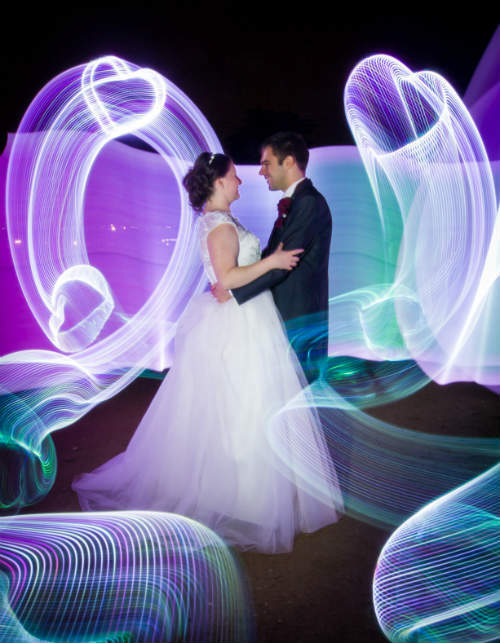 The Light Painters use a form of long exposure photography similar to making trails with sparklers on Bonfire Night. 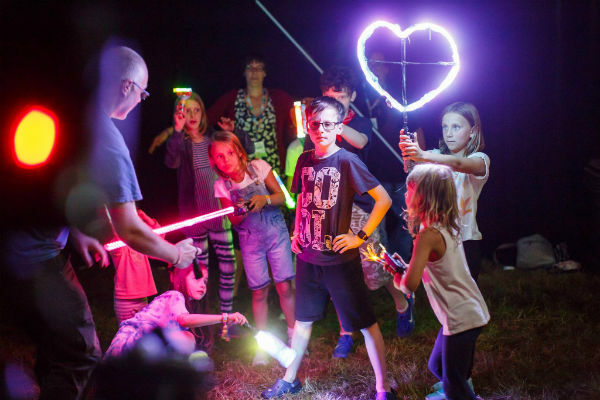 However here guests get to play with an array of homemade light ‘brushes’, torches, lightsabers and wands to create dazzling portraits, abstract masterpieces and amazing animations in a matter of seconds; there are literally infinite possibilities for creativity in this magical process. 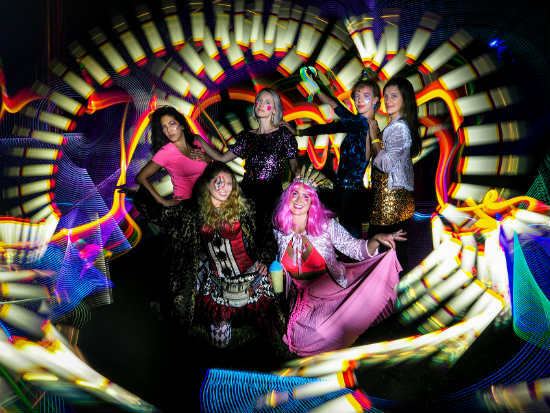 Individuals and groups can pose for a portrait whilst other guests go wild with lights around them or you can have the Light Artists create specific scenes or images around you on request. 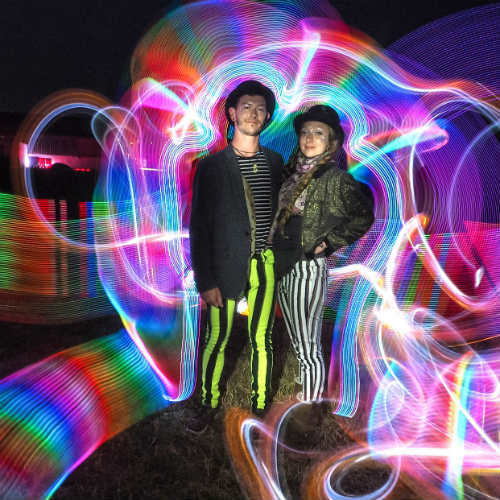 Perhaps you would like to shoot lasers from your hands, be dressed in a neon mermaid outfit surrounded by fish The Light Painters can draw whatever you can imagine into your scene. 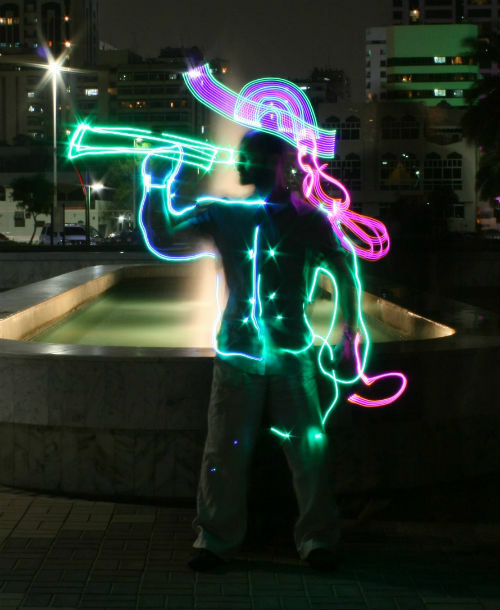 Simple animations can be created by making sequences of light paintings. You can create a garden of dancing flowers or have words or love hearts rise from the ground and spin around you; and if that all sounds a bit too pink and fluffy then maybe you’d like to shoot flames from your hands? 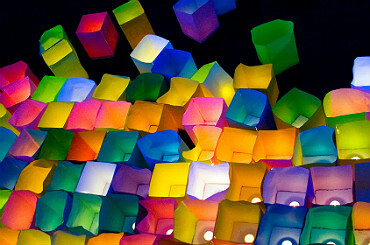 Light art is a perfect activity for parties, conferences, festivals, trade shows, weddings and more and works indoors or outside. It’s way more interesting than any photo booth and the images you create will become treasured keepsakes to remind you of the occasion. 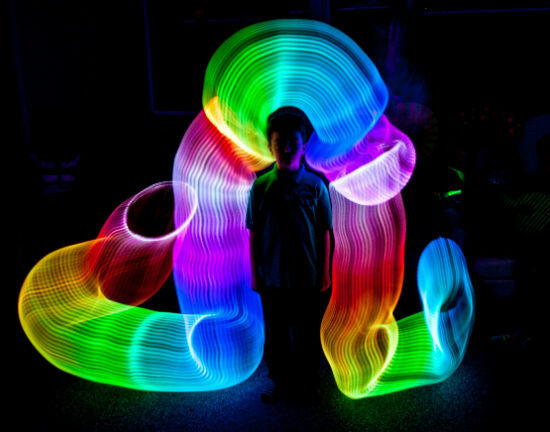 The Light Art works for all ages and abilities and requires no artistic skill – although the artists amongst you will have great fun adapting to this new technique. 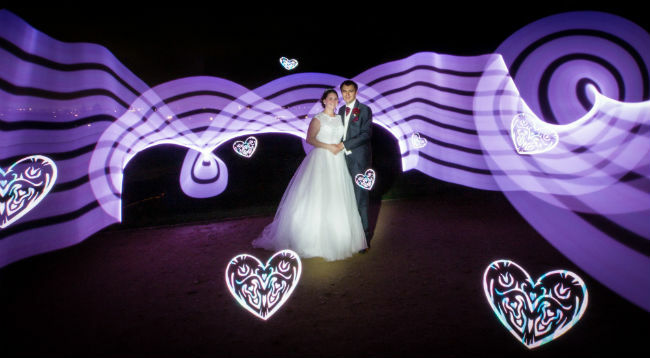 Using pre-programmed LED wands The Light Painters can add themed artwork, logos, text, branding or in fact any digital image into the shots. These amazing wands are waved through the scene as the photograph is taken leaving behind trails of almost anything such as ribbons, butterflies, spaceships, celtic knots, flames, fishes or fairy dust! A single photo can take between 15-60 seconds to create; the process is broadcast to nearby screens in real-time and the final images are instantly viewable at the end of the shot. The images are available as a free download during the event, with an edited gallery available soon afterwards. 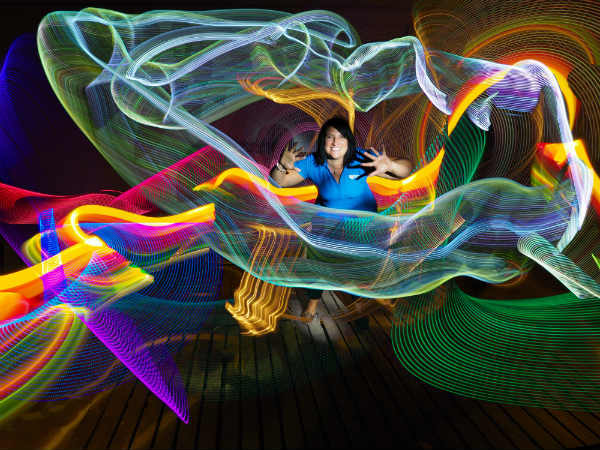 In some circumstances, normally smaller gatherings, the Light Painters can provide onsite printing. 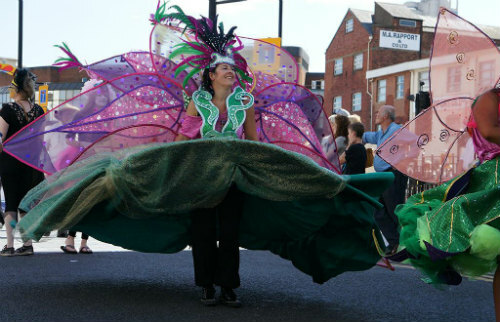 Generally for bigger events it is recommend to stick to the online gallery so that full attention can be given to making as many photos as possible. 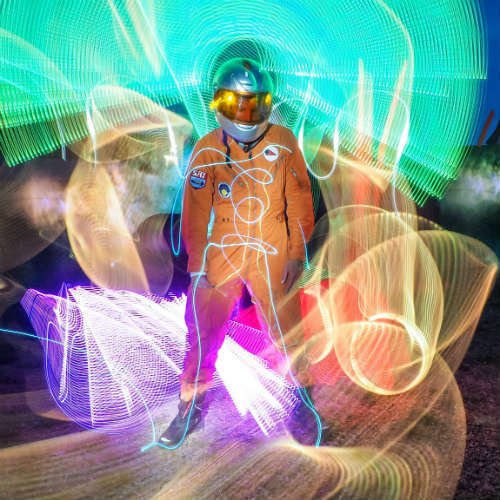 The Light Painters ‘ process is quite unique in that it requires no booth or black out room and can even work in daytime in a shaded environment. 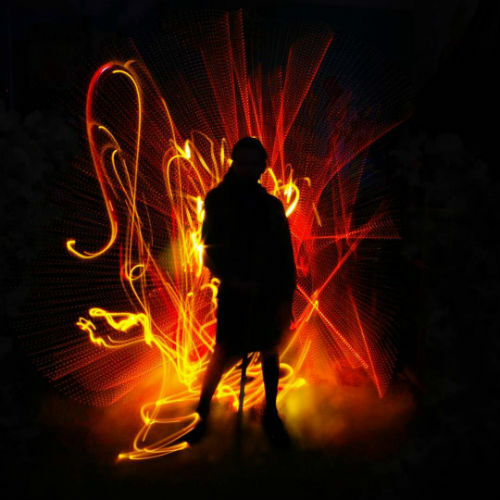 The Light Painters can set up in a dedicated space or quickly set up in various places around a venue. They also have the ability to bring a 5m x 5m inflatable dome for weather protection or to help dim particularly bright environments. 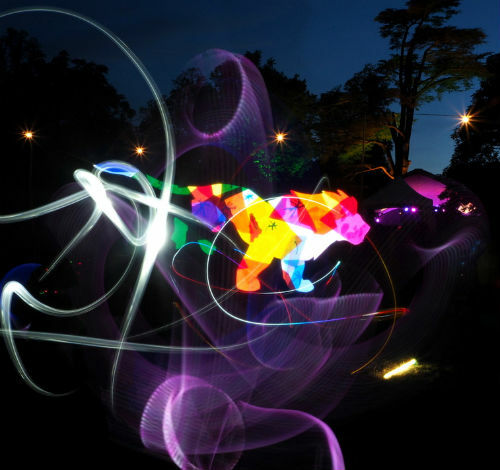 The Light Painters have worked with many thousands of participants across the UK and at festivals and events in Paris, Munich, Frankfurt, Malta, Spain and the UAE. 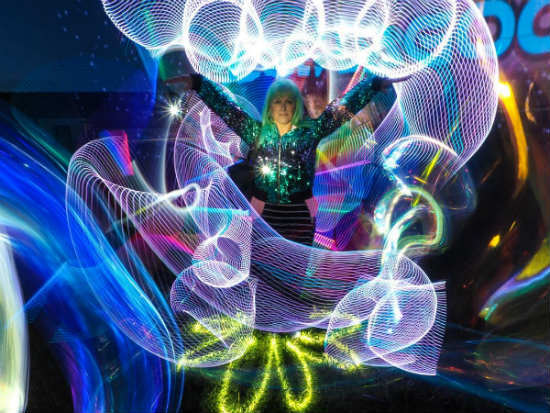 Our friends suggested we go along to a light painting workshop by Andy O’ Rourke (not Andy Rourke former bassist with the Smiths). 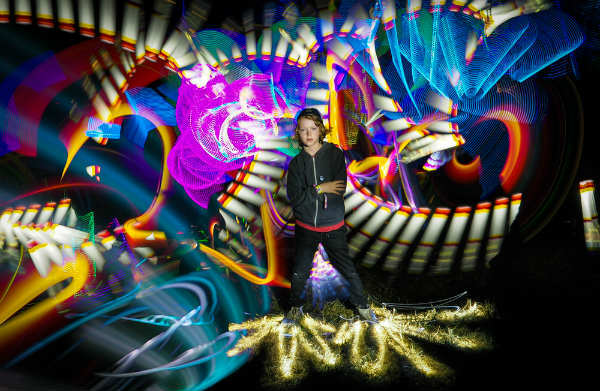 It was one of our highlights as we created pictures using a host of handheld lights and torches. I won’t go into how it’s done as I don’t understand it but hasten to say it was great fun and the results were astonishing. 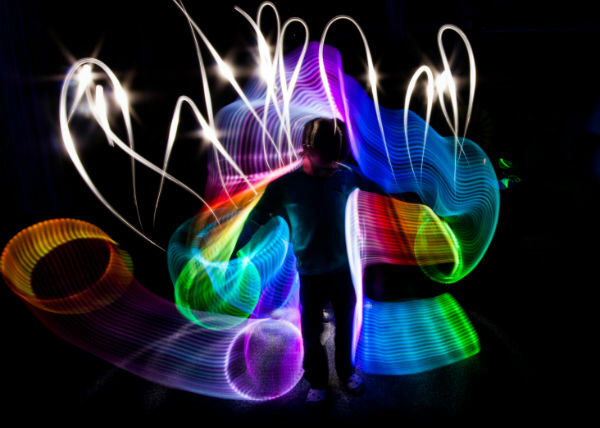 The magical concept of drawing with light becomes a wonderful reality with Andy O’Rourke’s light drawing sessions. Working in the dark presents an opportunity for freedom of expression whether you’re five or fifty five and the captured moments are both beautiful, cool and compelling. 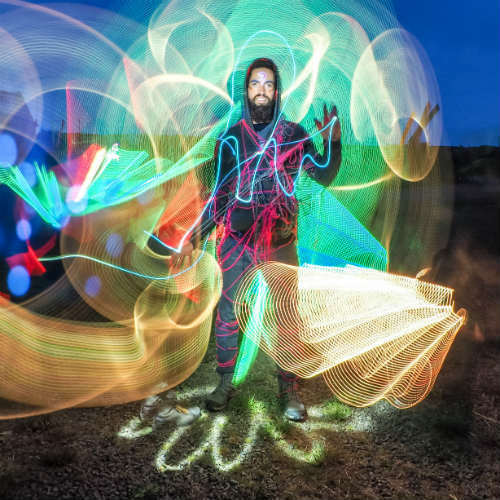 For some years now I have employed Andy of Malarky Arts to do his light painting at Green Man festival and events at Ashton Court Estate because it is innovative and unique which adds that extra qudos to the events plus the clients love the images. I’d also add we love the way Andy is ‘discreet’ in how he operates so that he never interferes with the parties, he’s always early, fully prepared and provides what we or our client needs without fuss. He is a pleasure to work with.